Kevin Abrams interviewed for but did not get the Giants’ general manager job. Yet. The assistant general manager who served as the interim general manager for the final four weeks of the season after Jerry Reese was fired, appears to have gained a more prominent role (if not title) in the front office. Abrams was part of the team, along with co-owner John Mara and general manager Dave Gettleman, who interviewed Steve Spagnuolo for the head coach vacancy on Wednesday. According to a source, Abrams will be with the Giants’ entourage as they continue their interviews and he will be part of the decision-making process. That may also indicate Abrams, 43, is being groomed to eventually take over from Gettleman, 66. While Gettleman has shown no indication that he has a timeline on his tenure with the Giants — “I’m going to keep doing it until they either take my key card or the Lord calls me home,” he said last week in his introductory news conference — he could be contemplating retirement at some point in the not-very-distant future. In fact, he may have already been ready for that phase of his life. According to a source close to Gettleman, the job as general manager of the Giants was the only one for which he considered leaving his post-football life to accept. 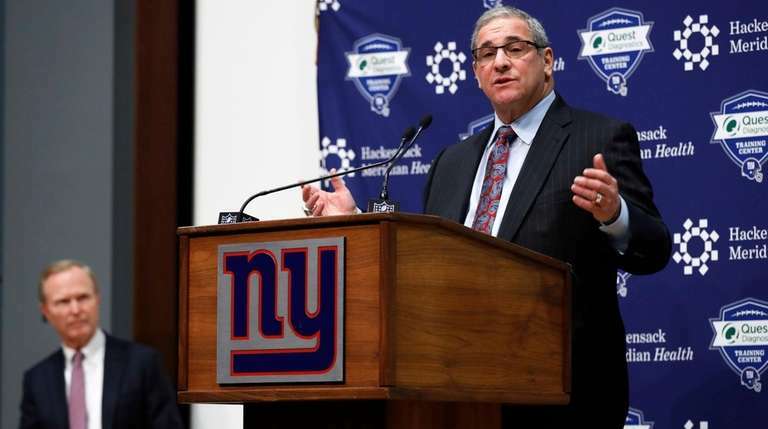 Having Abrams in place behind Gettleman would theoretically extend the unbroken chain of general managers that the Giants have had since they hired George Young in 1979. Young begat Ernie Accorsi, who begat Reese and Gettleman, who may beget Abrams. Of course, that all depends on how successful Gettleman is. If he can’t lift the Giants out of their doldrums, then being his second-in-command may not be worth much at all when it comes time to find his replacement.